Have you applied for TGC -117 course of Indian Army and want to know SSB interview dates? Indian Army has published list of shortlisted candidates and their date of SSB interviews. Read on to know about TGC 117 course SSB dates. Indian Army is about to recruit young engineers of India for technical branch officer posts. Notification for TGC 117 course was released in January 2013. Engineering graduates, final year students and M Sc Computer Science holders have applied for TGC course of Indian Army. With TGC course, one can become an officer in Indian Army and can earn good salary along with many benefits and allowances. Indian Army officially announced the SSB interview dates of TGC – 117 course. Till now, only Bangalore Service Selection Board interview dates have been announced. Bhopal and Allahabad SSB interview dates of TGC – 117 course are still awaited by the applicants. First SSB interview of TGC – 117 course will begin on 27 February 2013. Candidates who have failed to attend SSB interviews at specified dates can undergo same interview on 14th May 13. If you have missed out to fill up application for TGC – 117 course and want to become technical officer, read 41st / 12thShort Service Commission (Technical) course notification through which Indian Army is about to recruit officers in technical branch. 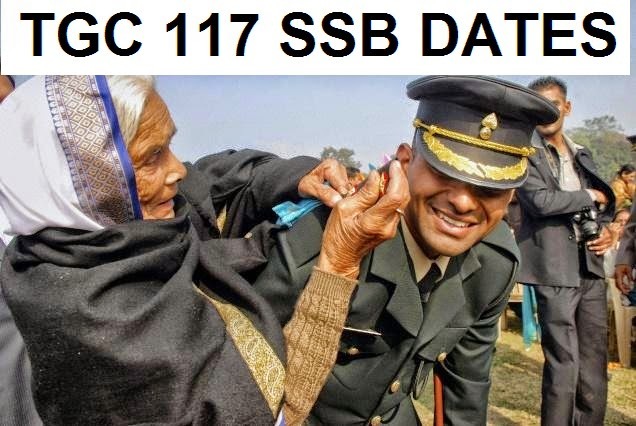 Check Bangalore SSB's TGC - 117 interview dates here. Check Bhopal SSB's TGC - 117 interview dates here.